People suffering from neuropathic pain know that their options for immediate and long-term relief are not many. However, Dr. Robert Nocerini with Physician Partners of America in Dallas has experience treating patients suffering from neuropathic pain. Among the more popular treatments is a procedure known as spinal cord stimulation. In this article, Dr. Nocerini goes into detail about what spinal cord stimulation is, who would be a good candidate, what patients should expect and more. Spinal Cord Stimulation (SCS) devices are used to treat several different kinds of chronic pain. Spinal Cord Stimulation is FDA approved and has been in use for over 40 years. A spinal cord stimulator consists of one or more thin wire leads and a small battery generator that looks similar to a pacemaker. The leads are placed in the spinal epidural space and deliver a low-level electrical current to interfere with the sensation of pain. SCS is used to treat pain in the arms, legs or trunk. It is mainly used to treat neuropathic type pain, meaning pain that is generated and maintained by a problem with the nerves themselves, as opposed to pain from joints or muscles. Candidates have had chronic neuropathic pain for greater than 6 months, and they have been treated unsuccessfully with physical therapy, medications (over the counter and prescription, such as non-steroidal anti-inflammatory medications, neuropathic medications, opioids), steroid injections, and sometimes surgery. What are the Conditions Treated by Spinal Cord Stimulation? SCS is indicated for the treatment of intractable pain in the back and legs that is caused by nerve impingement or irritation, known as “radiculopathy.” This may result from arthritis or a herniated disc that affects the spinal nerve roots. Some people continue to have pain after spine surgery. The terms “Post-laminectomy Pain Syndrome” or “Failed Back Surgery Syndrome” are names that have been used to describe this type of chronic pain condition. Better outcomes are more likely if SCS is initiated less than three years after surgery. There are many different causes of Painful Peripheral Neuropathy (PPN), but commonly this condition is due to diabetes. SCS may be indicated if standard pain medications for PPN are ineffective or have intolerable side effects. Complex Regional Pain Syndrome, formerly known as Reflex Sympathetic Dystrophy (RSD), is a chronic pain condition that sometimes develops in the arms or legs after trauma. SCS is indicated if pain is refractory to physical therapy, medications, or injections. Like Failed Back Surgery Syndrome, better outcomes are associated with a shorter time period between diagnosis of CRPS and initiation of Spinal Cord Stimulation. 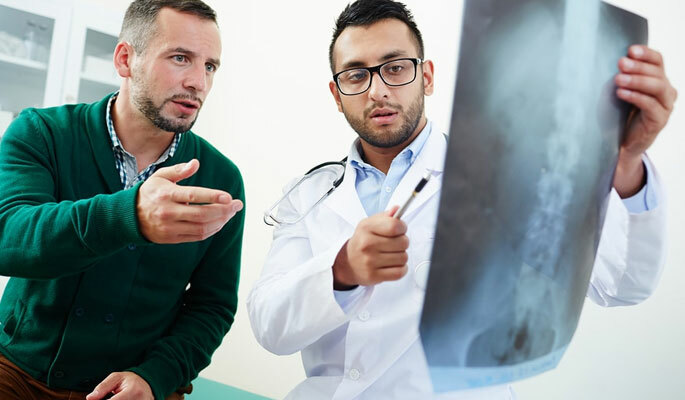 Scarring that occurs after spine surgery may sometimes lead to Arachnoiditis or Epidural Fibrosis, two conditions that may lead to chronic pain. The scarring occurs around the spinal nerves causing irritation and pain. Studies are limited, but patients with pain due to multiple sclerosis may benefit from spinal cord stimulation. Does spinal cord stimulation cure chronic pain? Spinal Cord Stimulation interferes with the ability to perceive pain. It does not heal or cure the underlying cause of the pain. What are the Limitations of Spinal Cord Stimulation? Spinal Cord Stimulation cannot treat all types of pain. It is less successful at treating pain due to spinal cord injuries, phantom limb pain, intercostal neuralgia, and post herpetic neuralgia. In some patients, pain relief may diminish over time, possibly due to movement of the leads, new tissue growth around the leads, changes in the nature or location of the pain, or they may develop uncomfortable stimulation. Also, there are mechanical limitations of the equipment, which may need to be replaced over time. Newer technology can mitigate some of these limitations. Spinal cord stimulation is generally a safe procedure, but there is the possibility of complications. Like any injection, procedure, or surgery involving the spine, risks include bleeding, infection, nerve injury, or a spinal headache. What is the evaluation process for spinal cord stimulation? Patients should have had chronic pain for more than 6 months, have an objectively identifiable source of pain, conservative measures have failed, and surgery is not indicated. Patients should have an education period, have their questions and concerns addressed, and they should also be able to discuss their expectations. All patients should go through a psychological evaluation to determine if depression or other psychiatric illness is present, which may decrease the likelihood of a successful outcome. Contraindications are pregnancy, severe spinal stenosis, presence of a pacemaker, or active substance abuse. Each patient is unique, and the decision whether to proceed with a stimulator trial ultimately is based on the specific medical history of each patient. An advantage of spinal cord stimulation over other surgeries is that patients may go through a reversible trial period of stimulation to see if it works for them. The trial procedure is performed much like an epidural steroid injection, using fluoroscopy to visualize and guide one or more stimulator leads through a hollow needle and into the epidural space. Test stimulation is performed to find the location that best reduces pain. The leads are secured and then attached to an external generator that the patient wears on a belt. The trial period then takes place at home, and lasts from 3-5 days. If pain reduction or functional improvement is adequate during this period, the patient and physician can discuss implanting a permanent system. The permanent procedure is similar to the trial, except a small battery generator is implanted under the skin after attaching it to the leads. What does Spinal Cord Stimulation Feel Like? Spinal Cord Stimulation typically creates what is called a paresthesia. Patients may describe a tingling or massaging sensation, or they may feel nothing at all. A newer type of SCS, called High-Frequency SCS, has no paresthesia associated with it. Is Spinal Cord Stimulation Permanent? The stimulator leads placed in the initial trial period can be easily removed in the doctor’s office without the need for sedation or anesthesia. Even though implantation of a spinal cord stimulator is referred to as “permanent,” the system is reversible, and in most cases it can be removed. This requires a short minor surgery. What are New Advances in Spinal Cord Stimulation? Advances in hardware and software programming are improving the effectiveness of spinal cord stimulation. Another significant recent advance is the development of High-frequency Spinal Cord Stimulation, which works without the paresthesias of traditional systems.